Disclaimer: These links have been provided as a service to Think Like A King customers for informational purposes only. We are not able to ensure the accuracy, legality or content of the materials, products or services offered by these links, nor does the presence of these links imply our endorsement. Please report broken or obsolete links to info@schoolchess.com. Operation Chess - www.operationchess.org A non-profit organization started by a 7th grader in Wisconsin to send chess sets to American soldiers stationed overseas. 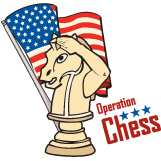 For every $20 raised, Operation Chess can send two chess sets to soldiers. Scholastic Chess - Curriculum Guides by Alexey Root, PH.D.